Back row L – R: City Manager Lon Squyres, Linda Jamail (Community Liaison Rep. Ana Hernandez office), Councilmen Jimmy “JJ” Rivas, Allen Lee, Mario Gonzales and Ivan Rojas, Parks and Recreation Director. Cutting the ribbon L – R: Brothers Ricardo and Emmanuel Navarro, Councilman Gregg Robinson and Mayor Ana Diaz. 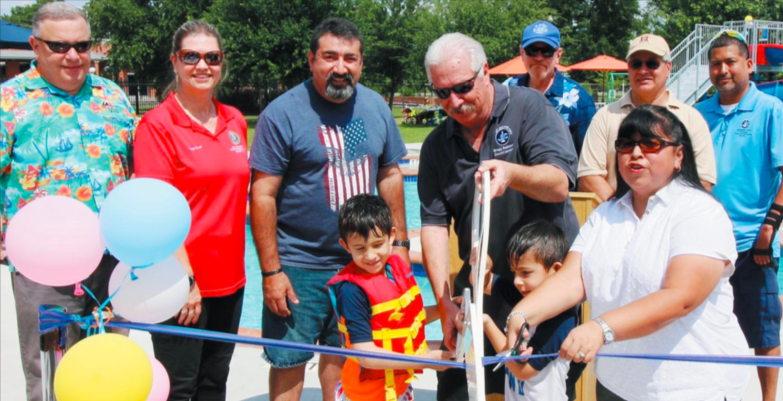 Saturday, May 26, 2018 — Jacinto City opened its swimming pool, which boasts a twisting turbo slide, splash pad, and an area with a river-like current that takes swimmers swirling swiftly at fast speeds around the pool. City Manager Lon Squyres said the state of the art pool automatically checks and adjusts the chlorine and chemical levels of the water to insure the water stays healthy while in use. L – R: John Moore and Sonya George, (GPISD), Linda Jamail, (Community Liaison State Representative Ana Hernandez office), State Senator Sylvia Garcia, Yuroba Harris, (Community Liaison Congressman Gene Green office), Cloverleaf Principal Lee Brown, Dr. Wanna Giacona, (GPISD), Ken Wallace, Realtor Frank Nadolney, and Wilfred Broussard, Jr. (GPISD). Houston, TX. — May 22, 2018 — Galena Park School District’s Cloverleaf Elementary held their ground breaking ceremony with community members and both former and current staff members present. “We look back with nostalgia and forward with excitement as Cloverleaf Elementary students and staff celebrated the ground breaking. It is difficult for us to let go of such a historic part of the Galena Park ISD community, but we know the new building will continue the legacy of serving the families of the Cloverleaf neighborhood,” says Lee Brown, principal of Cloverleaf. 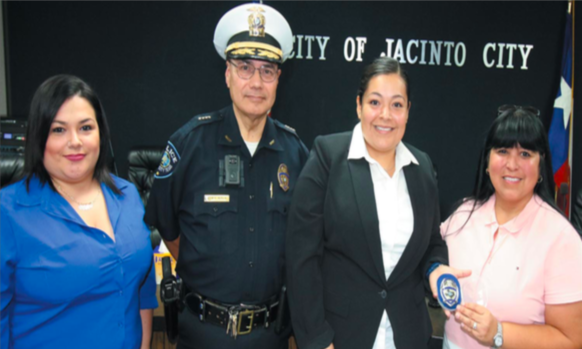 Officer Desiree Montez (in black suit and white shirt) was sworn in recently as new Jacinto City Officer, to her right, Mayor Ana Diaz, to he left, Chief Joe Ayala and Sabrina Gutierrez (Officer’s sister). 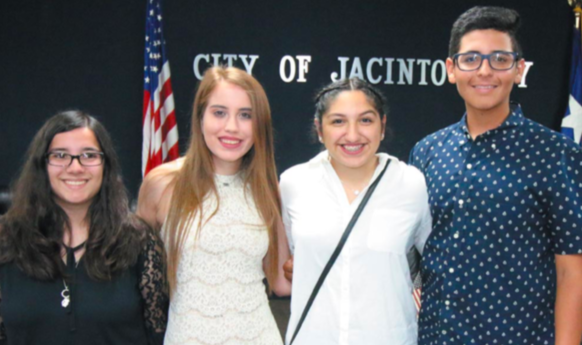 Jacinto City’s 2018 top 10 percent GPISD graduates: L – R: Sydney Becerra, Melissa Garcia Ramirez, Alyssa Lopez and Christopher Diaz Jr.
Not present: Eli Anahi Gallo, Nallely Lizeth Garcia Mejia, Stephanie Garcia, Sarae Marie Gutierrez, Eduardo Hernandez Lopez, Jayda Alexis Martinez, Frank Nieto, Alyssa Victoria Puga, Carina Lucia Reynoso, Jocelyn C. Salgado, and Jaqueline Vela. Furr High School, Houston, TX. — May 18, 2018 — Furr High School’s Interim Principal Rose Hernandez began the Building Dedication and Ribbon Cutting Ceremony, welcoming citizens, community leaders, and officials. The ceremony began with Furr’s Junior Reserve Officer Training Corps (JROTC), led by Emily Gomez Cadet Colonel, posting the Colors. Commander Sergeant Major Isiah Galindo led in the pledge. Entertainment was given by the JROTC Drill team, led by Commander Grace Danas, the school band, the Sparkles dancers, and cheerleaders. 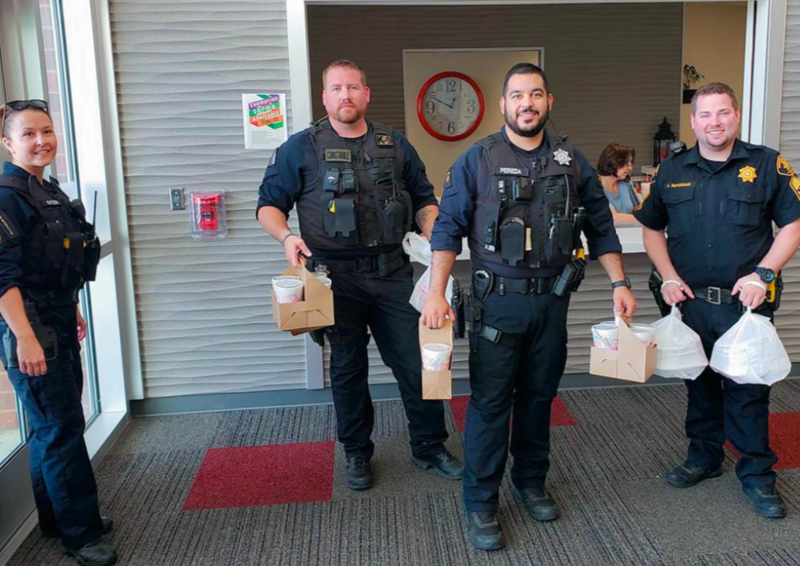 Reflections on Furr were made by students, Angela Gomez, Caleb Elam, and Ernesto Salazar. THE WINNING RAFFLE TICKET is pulled from the tumbler at the end of the Fish Fry. It belonged to Rotarian Frank Nadolney. ABOVE, raffle chairman Shawn Silman helps announce the winner, after Fish Fry chairman Bill Bowes pulls it out. 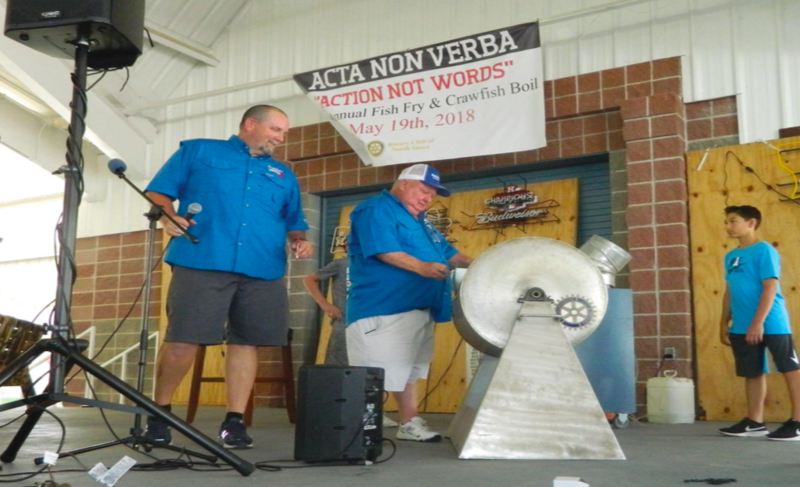 A record crowd showed up at the Rotary Pavilion on Wallisville Road last Saturday, May 19 to participate in the 43rd annual North Shore Rotary Catfish Fry and Crawfish Boil. Attendees are motivated by the opportunity to win a new car or truck in the raffle, but they also benefit from time spent with friends. The Fish Fry is held every year to raise money for local community projects, scholarships, and the International projects such as Polio Plus. In addition to the raffle, there was a live auction with a record 82 items, many of them selling for over a thousand dollars. The major sponsors for the event were Community Toyota, Bestway Oilfield, Blue Northern A/C, Channelview Education Foundation, Crawfish Shack, Galena Park Education Foundation, North Channel Area Foundation, and San Jacinto College Foundation, as well as 16 other businesses and individuals. The North Shore Rotary Club typically raised several hundred thousand dollars at this event, and in turn provides scholarships, and supports groups such as Little League, Pct. 2 parks, and needy families at the holidays. Allan Jamail NC Star writer and Principal Sandra Rodriguez, at Woodland Acres Elementary Career Day. Houston, TX. – Thursday, May 17, 2018 — Career Day at Woodland Acres Elementary School, of Galena Park Independent School District. 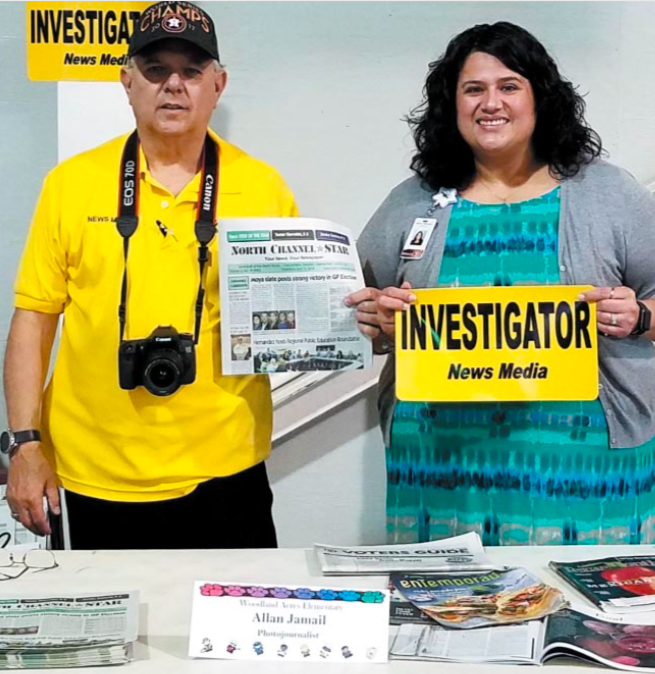 NC Star writer Allan Jamail presented the career path to journalism and the educational requirements for becoming a journalist to the 150 third, fourth and fifth graders in attendance. He stressed the need for students to strive to perfect their skills in spelling, punctuation, pronunciation, grammar and writing. Journalists investigate to give the public accurate information on current events through the newspapers, magazines, television, radio and internet online websites. Their job is to thoroughly investigate and research important news stories and to present them in a clear and understandable manner.